Bald Guy here, better known to the Debs and Errol crowd as James P Sheridan (as Errol insists on referring to me by my full name – go figure). 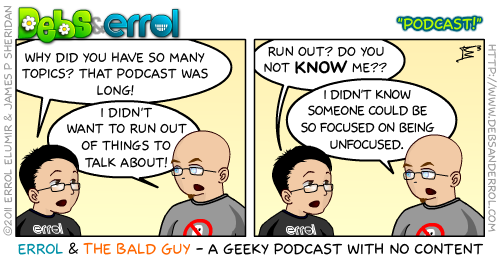 Errol has asked me to introduce everyone to our BRAND NEW PODCAST – ERROL AND THE BALD GUY!!! This is only tangentially related to Debs and Errol, but since they have webspace and we don’t know where this thing will go, I am setting up shop and taking up space here. Truth be told I have wanted, for years, to do a podcast even before podcasting was a thing. But I always lacked the means and a partner interested enough to babble long enough. Along comes Errol who not only has the equipment, but doesn’t stop talking and has been looking for geeky people to collaborate with since the dawn of man. It was a match made in geek heaven. So this past Friday night he invited me over to his lovely home to meet his lovely family and annoy them as we drone on about things they couldn’t possibly care less about. That said, while we droned on for nearly two hours, it was immense fun, despite nerves and my endless inability to finish a single thought. This is our attempt at a podcast, as meandering and off-topic as it might get, and we hope you enjoy. Wait! We should warn you guys on the time of these. Part 1 is 34 minutes, and 34 megs in size. Part 2 is only 30 minutes, and 30 megs in size. I’ve never done podcasts before, so if there is an easier way to display them, please do tell. This episode takes a look back at Geeky events of 2011, the people we lost this past year and things to look forward to in 2012. P.S. I feel terrible because poor Errol had to go through our endless non-sense and try to edit it down to a reasonable length. No joke this thing was twice as long and I am sure it was infinitely more boring. However, we learned from the experience and hopefully next week’s episode will be even better! The intro and outro is Tchaikovsky’s “Souvenir of Florence Movement 3“. Beyond that I’ll have to admit that I’m more on the Anne McCaffrey/ Doctor Who/ Anime side of geekdom than the comic book side. I’m waiting here for my ride to church, checking comments. And James P Sheridan IS a Doctor Who fan. But he loves comics a lot more. Editing is HARD! Do I keep this in, do I not? I mean… me going on for two hours is LONG! I can’t believe I listened to that entire first part. Wow, I can’t believe I listened to that whole thing. And I can’t believe you actually went on a tangent about wearing no pants…. And I can’t believe there was still two minutes left AFTER you had already signed out!! But can you believe its not butter? !